Education and recreation go hand-in-hand. Where there is a place and importance for education, there is a similar place and importance for recreation. The contribution of zoos for nature and biodiversity protection is often neglected in the political debate about these issues. Nevertheless, zoos play an important role by raising people's awareness for the need to protect species and their habitats. 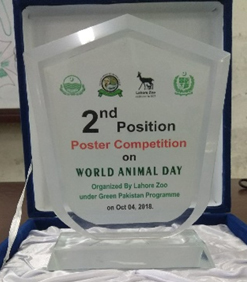 To show this importance, students as well as citizens all over the city were given the opportunity to come organized by Department of Wildlife & Parks Government of the Punjab and Zoo Management Committee, Lahore to celebrate World Animal Day on the 4th of October, 2018 at Zoological Gardens, Lahore. 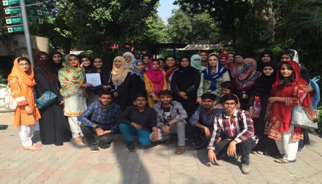 This event was arranged between different colleges and universities from Lahore for the poster competition under the theme "ROLE OF ZOOS IN BIODIVERSITY CONSERVATION" .Prof. Dr. Anjum Nasim Sabri (Chairperson), Dr. Samreen Riaz (Assistant Professor), Dr Nageen Hussain (Assistant Professor) and MsFarhaQudsia (MS Research Scholar) were main organizers from the department of MMG. Dr. Samreen Riazwas also acting as chief Coordinator from the Department of Microbiology and Molecular Genetics, University of the Punjab, Lahore. The posters presented by the students the different Colleges and Universities like, University of the Punjab, Government College University Lahore, Kinnaird College, Islamia College Cooper road, Falah Foundation. 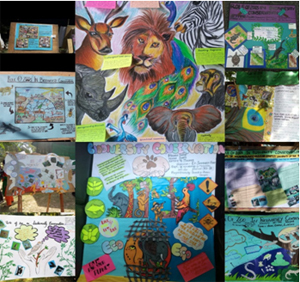 All the poster were very innovative, inspiring, informative, conceptual, unique and showed , showing the interest of youth in the conservation of the wildlife and their concern regarding the abuse of animals all over the globe. Students from the BS 3rd Semester (Human Shafaq, Muniba Shahid, Fatima tu Zehra) Department of Microbiology and Molecular Genetics, University of the Punjab, Lahore won the 2nd Best poster award with shield and certificate of honour. The purpose of this event to create awareness in the people in conserving the animal diversity and providing protection to them rather than approving and supporting hunting and poaching.